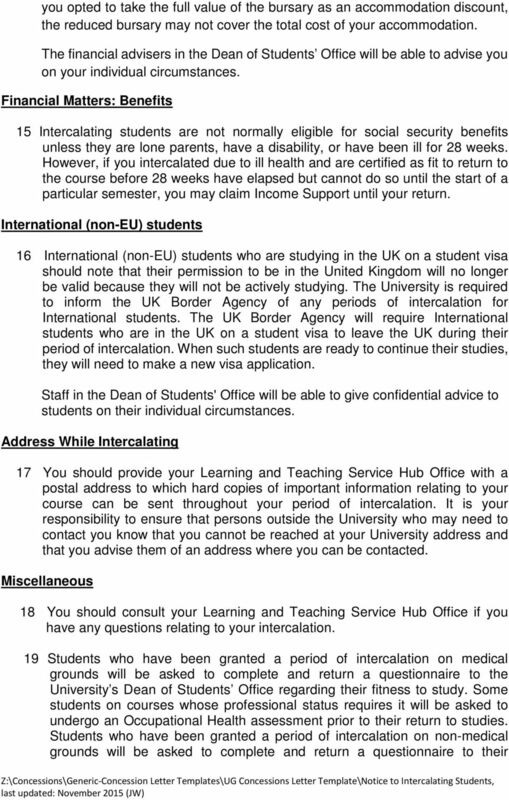 Download "NOTICE TO INTERCALATING STUDENTS - TAUGHT PROGRAMMES"
2 exceptional circumstances intercalating students may contact the Dean of Students Office if they believe that there is a good reason why an exception should be made in their case. (2) You may wish to seek the advice of the Accommodation Office about your eligibility for accommodation in University residence at the end of your period of intercalation. Undergraduates who intercalate before Easter during their first year and return in September are guaranteed a room in residences, provided they fill in an Accommodation Preference Form (APF) and return it before the end of July; those who return in January will be offered a room if one is available. Other students are not guaranteed a room in residences on their return. APFs are not automatically sent out to intercalating students. If you are returning from intercalation in September and wish to apply for a room in residence, it is important that you contact the Accommodation Office before the Easter break. 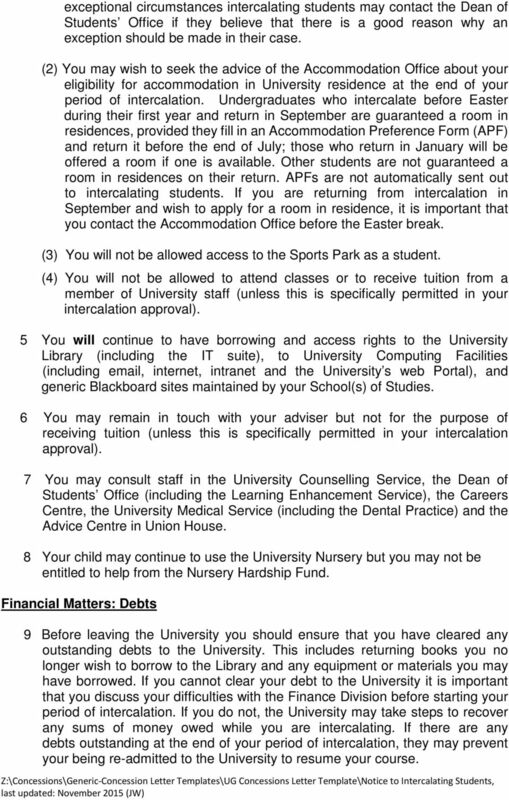 (3) You will not be allowed access to the Sports Park as a student. 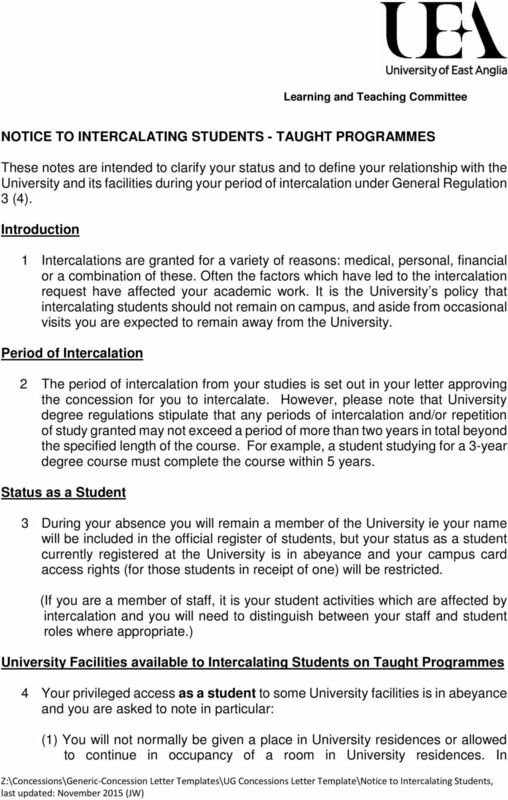 (4) You will not be allowed to attend classes or to receive tuition from a member of University staff (unless this is specifically permitted in your intercalation approval). 5 You will continue to have borrowing and access rights to the University Library (including the IT suite), to University Computing Facilities (including , internet, intranet and the University s web Portal), and generic Blackboard sites maintained by your School(s) of Studies. 6 You may remain in touch with your adviser but not for the purpose of receiving tuition (unless this is specifically permitted in your intercalation approval). 7 You may consult staff in the University Counselling Service, the Dean of Students Office (including the Learning Enhancement Service), the Careers Centre, the University Medical Service (including the Dental Practice) and the Advice Centre in Union House. 8 Your child may continue to use the University Nursery but you may not be entitled to help from the Nursery Hardship Fund. Financial Matters: Debts 9 Before leaving the University you should ensure that you have cleared any outstanding debts to the University. This includes returning books you no longer wish to borrow to the Library and any equipment or materials you may have borrowed. 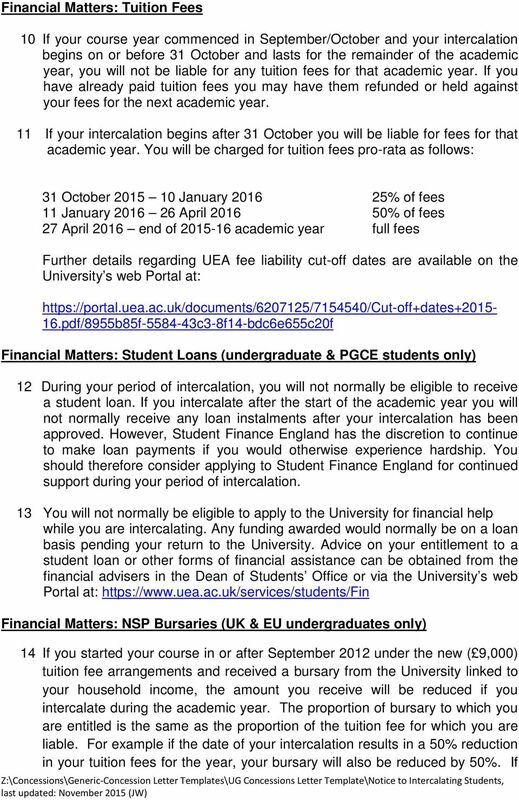 If you cannot clear your debt to the University it is important that you discuss your difficulties with the Finance Division before starting your period of intercalation. If you do not, the University may take steps to recover any sums of money owed while you are intercalating. If there are any debts outstanding at the end of your period of intercalation, they may prevent your being re-admitted to the University to resume your course. 5 Learning and Teaching Service Hub Office regarding their readiness to return to studies. The letter approving your intercalation will make it clear which of these procedures you need to follow. 20 On your return to the University you will be subject to University Regulations then in force, unless otherwise specified. 21 On your return to studies you might like to re-familiarise yourself with the confidential help, guidance and support services offered by the University's Dean of Students' Office. 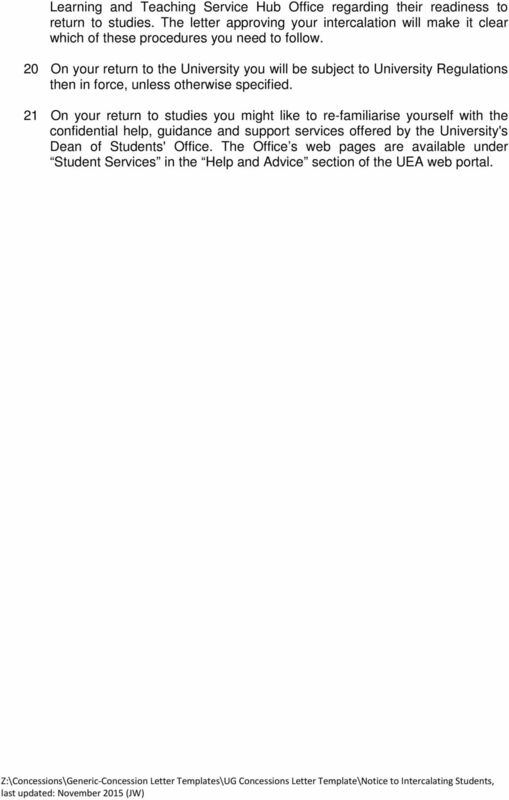 The Office s web pages are available under Student Services in the Help and Advice section of the UEA web portal. Student Finance 2014/15 Full-Time Undergraduate How much are the fees for New Students? Foundation Degrees 6000* Full Time Undergrad 9000* * Subject to OFFA approval What Student Finance is available? Get a degree-level qualification without breaking the bank. How many of you are worried about the finance of university? How many of you know how the graduate contribution scheme works? Date Stamp (Office use) Student Hardship Application Form Please read the notes and checklist prior to completing this form. Help is available with filling out the application form from Student Support. Student Finance. Tuition Fees. Living Expenses. What statutory support can I get?